The name “The Sun” is a proper English noun which evolved from the Old English sunne, which may be related to the word south. Other Germanic forms of the name – ranging from sunne and sonne in Old Frisian to sunna in Old High German and Old Norse to sunno in Gothic. All Germanic terms for the Sun stem from the Proto-Germanic “sunnon“, which is in turn derived from the sauel or sauol of Proto-Indo-European. The English name for Sunday stems from the Old English Sunnandæg (literally “Sun’s day”) which was in use before 700 CE. This name resulted from the Germanic interpretation of Latin dies solis, which is itself a translation of the Greek heméra helíou. The Latin name for the Sun, Sol, is widely known but is not in common use. However, the adjectival form solar is used widely to refer to phenomena or attributes pertaining to the Sun. The Sun is a G-type main-sequence star that comprises about 99.86% of the mass of the Solar System. The Sun has an absolute magnitude of +4.83, which is estimated to be brighter than about 85% of the stars in the Milky Way – most of which are red dwarfs. With a diameter of 696,342 ± 65 km and a mass of approximately 1.988 × 1030 kg (1.9 trillion quadrillion metric tons), the Sun is 109 times as large as Earth and 333,000 times as massive. Being a star, the Sun’s density varies considerably between its outer layers and its core. On average, it has a density of 1.408 g/cm3, which is roughly one-quarter that of Earth. However, models of the Sun estimate that it has a density of 162.2 g/cm3 closer to the core, which is 12.4 times that of Earth. Although our Sun appears to be yellow, it is actually white. It merely appears to be yellow because of the effect of the atmosphere. Our Sun is brighter than most of the other stars in the galaxy (which are also red dwarfs) and only about 5% of stars in the Milky Way are larger than the Sun. The Sun is a member of the Population I group of stars, which describes luminous, hot, and young stars that are typically found in the spiral arms of galaxies. Estimates of the Sun’s temperature also vary the closer one gets to its core. Within the center, temperature are estimates to be as high as 15.7 million K (15,699,726.85 million °C/28,259,540.33 million °F), while the Corona experiences temperatures of about 5 million K (4,999,726.85 °C/ 8,999,540.33 °F), and the visible surface (photosphere) reaches an effective temperature of 5778 K (5504.85 °C/9940.73 °F). Because the Sun is made of plasma, it’s also highly magnetic. It has north and south magnetic poles like the Earth, and the magnetic field lines create the activity we see on the surface. The darker sunspots – cooler areas which last for a few months and vary greatly in size – are created when magnetic field lines pierce through the Sun’s photosphere. Sunspots appear in cycles and sometimes there are none visible at all. Coronal mass ejections and solar flares occur when these magnetic field lines snap and reconfigure. The amount of activity on the Sun rises and falls over an 11-year cycle. At the low point, called solar minimum, there are few, if any sunspots. And then at the high point of the cycle, solar maximum, there are the most sunspots and the greatest amount of solar activity. The Sun is by far the brightest object in the sky, with an apparent magnitude of -26.74, which is about 13 billion times brighter than the next brightest star (Sirius, which has an apparent magnitude of -1.46). The mean distance of the Sun to Earth is approximately 1 astronomical unit or AU (150,000,000 km/93,000,000 mi), though this changes due to variations in Earth’s orbit. At this average distance, light travels from the Sun to Earth in about 8 minutes and 19 seconds. The energy of this sunlight supports almost all life on Earth by photosynthesis, and drives Earth’s climate and weather. The Sun is composed primarily of the chemical elements hydrogen and helium, which account for 74.9% and 23.8% of the mass of the Sun in the photosphere, respectively. All heavier elements account for less than 2% of the Sun’s mass, with oxygen (roughly 1% of the Sun’s mass), carbon (0.3%), neon (0.2%), and iron (0.2%) being the most abundant. The interior of the Sun is differentiated between multiple layers, which includes a core, a radiative zone, a convective zone, a photosphere, and an atmosphere. The core is the most dense and hottest region of the Sun (150 g/cm³/15.7 million K) and accounts for about 20–25% of the Sun’s overall radius. The Sun takes about 1 month to rotate once on its axis; however, this is a rough estimate because the Sun is a ball of plasma. Recent analysis has indicated that the core has a rotation rate that is faster than the outer layers of the Sun. At the outer layers, near the equator, it rotates about once every 25.4 days; whereas nearer to the poles, it takes up to 36 days to complete a single rotation. It is also in the core where the majority of the Sun’s energy is produced through nuclear fusion, which converts hydrogen into helium. Nearly 99% of the thermal energy created by the Sun occurs within this region – which accounts for 24% of the Sun’s interior. By 30% of the radius, fusion processes have nearly ceased. The rest of the Sun is heated by this energy, which is transferred outwards to the solar photosphere before escaping into space as sunlight or high-energy particles. At the radiative zone, which extends from 0.25 out to about 0.7 solar radii, thermal radiation is the primary means of energy transfer. In this layer, the temperature drops with increasing distance from the core, from approximately 7 million K in the interior to 2 million K at the outer edge. The density also drops a hundredfold – from 20 g/cm³ to only 0.2 g/cm³. Between the radiative zone and the convective zone, there is a transition layer known as the tachocline. This region is defined by a sharp change in the uniform rotation of the radiative zone and the differential rotation of the convection zone, which results in a large shear. It is currently theorized that a magnetic dynamo in this layer is what is responsible for generating the Sun’s magnetic field. In the convective zone, which extends from the surface to approximately 200,000 km below the surface (0.7 solar radii), the temperature and density of plasma is lower. This allows thermal convection to develop as material heated below expands and rises, which then cools and contracts once it reaches the photosphere, causing it to sink again and for the convective cycle to continue. The visible surface of the Sun, otherwise known as the photosphere, is the layer below which the Sun becomes opaque to visible light. Above the photosphere, visible sunlight is free to propagate into space, and its energy escapes the Sun entirely. The photosphere is tens to hundreds of kilometers thick, being slightly less opaque than the air on Earth. Because the upper part of the photosphere is cooler than the lower part, an image of the Sun appears brighter in the center than on the edge or limb of the solar disk. At the photosphere, temperature and density reaches its lowest point – approximately 5,700 K and a density of 0.2 g/m3 (about 1/6,000th the density of air at sea level). Last, there is the Sun’s atmosphere, which is made up of three distinct layers – the chromosphere, the transitional region, and the corona. The chromosphere (literally “sphere of color”) is roughly 2,000 kilometers deep and has a very low density (10-4 times that of the photosphere and 10-8 times that of Earth’s atmosphere). This, combined with the brightness of the photosphere, makes the chromosphere normally invisible. However, during a total eclipse, its reddish color can be seen. Above the chromosphere is the thin transition region (200 km thick), where temperatures rise rapidly from 20,000 K in the upper layer to close to 1,000,000 K at the corona. This is facilitated by the full ionization of helium in the transition region, which significantly reduces radiative cooling of the plasma. This layer is not well-defined, instead forming a kind of nimbus around features in the chromosphere, and is in constant, chaotic motion. The transition region is not easily visible from Earth’s surface, but is visible in the ultraviolet spectrum. Lastly, there is the corona. In the lower region, the particle density is extremely low and the average temperature is about 1 – 2 million K – with the hottest regions ranging between 8 and 20 million K. This is believed to be due to the Sun’s magnetic field causing particle acceleration, which in turn creates kinetic (and thermal) energy. The corona is the extended atmosphere of the Sun, and the flow of plasma outward from the Sun into interplanetary space (aka. “solar wind“) forms the solar magnetic field into a spiral shape. This is known as the heliosphere, a magnetic sphere that extends beyond the heliopause (more than 50 AU from the Sun) and protects the Solar System from charged particles coming from the interstellar medium (aka. “interstellar wind”). The current scientific consensus is that the Sun formed around 4.57 billion years ago from the collapse of part of a giant molecular cloud that consisted mostly of hydrogen and helium, and probably gave birth to many other stars. As one fragment of the cloud collapsed, it also began to rotate (because of conservation of angular momentum) and heated up with the increasing pressure. Much of the mass became concentrated in the center, whereas the rest flattened out into a disk that would eventually accrete to form the planets and other Solar System bodies. Gravity and pressure within the core of the cloud generated a lot of heat as it accreted more matter from the surrounding disk, eventually triggering nuclear fusion. From this grand explosion, the Sun was formed. The Sun is presently in it’s main sequence phase, which is characterized by the ongoing production of thermal energy through nuclear fusion. Currently, more than four million tonnes of matter is converted into energy within the core, producing neutrinos and solar radiation. At this rate, the Sun has converted 200 times the mass of our Earth into energy (about 0.03% of its total mass). The Sun is becoming hotter because the helium atoms in its core are gradually occupying less volume than all the hydrogen that’s been fused. The core is therefore shrinking, allowing the outer layers of the Sun to move closer to the center and experience a stronger gravitational force. This stronger force increases the pressure on the core, which in turn is making the core denser. It is estimated that the Sun has become 30% brighter in the last 4.5 billion years, and is increasing in brightness at a rate of about 1% every 100 million years. At the end of its main sequence phase, the Sun will not go supernova since it does not have sufficient mass. Instead, once the hydrogen in the core is exhausted in 5.4 billion years, the Sun will begin to expand and become a red giant. It is hypothesized that it will grow large enough to encompass the orbit’s of Mercury, Venus, and maybe even Earth. The post AGB evolution is even faster, as the ejected mass becomes ionized to form a planetary nebula and the exposed core reaches 30,000 K. The final, naked core temperature will be over 100,000 K, after which the remnant will cool towards a white dwarf. The planetary nebula will disperse in about 10,000 years, but the white dwarf will survive for trillions of years before fading to black. The Sun lies close to the inner rim of the Milky Way’s Orion Arm, in the Local Interstellar Cloud (or Gould Belt). This places it at a distance of 7.5 – 8.5 thousand Parsecs (25,000 – 28,000 light years) from the Galactic Center. The Sun is contained within the Local Bubble, a cavity in the interstellar medium that contains rarefied hot gas. The Sun, and thus the Solar System, is found in what scientists call the galactic habitable zone, a zone which contains several characteristics supportive to life. These include the right mix of elements, an orbit that keeps it away from the dangerous spiral arms, and being at a sufficient distance from the galactic center so that it is not disrupted by its gravitational forces or too much radiation. The general direction of the Sun’s galactic motion is towards the star Vega in the constellation of Lyra, at an angle of roughly 60 sky degrees to the direction of the Galactic Center. Of the 50 nearest stellar systems within 17 light-years from Earth (the closest being the red dwarf Proxima Centauri at approximately 4.2 light-years), the Sun ranks fourth in mass. The Sun’s orbit around the Milky Way is believed to be elliptical, with the addition of perturbations due to the galactic spiral arms and non-uniform mass distributions. In addition, the Sun oscillates up and down relative to the galactic plane approximately 2.7 times per orbit. It takes the Solar System about 225–250 million years to complete one orbit through the Milky Way (a galactic year), so it is thought to have completed 20–25 orbits during the lifetime of the Sun. The Sun has been an object of veneration throughout prehistory and ancient human history. Most cultures believed it to be supernatural in nature or a deity, one who’s presence was intimately tied to time, the seasons, and the cycle of life. Worship of the Sun was central to civilizations such the ancient Egyptians, Sumerians, Inca, Aztecs and Mayans, as well as numerous cultures in Europe, West Asia and Africa. The earliest known examples of Sun worship are found in Proto-Indo-European mythology, where the sun is depicted as traversing the sky in a chariot (aka. a “solar chariot). 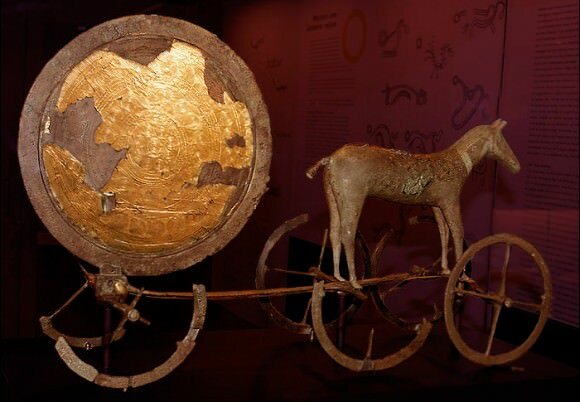 In Germanic mythology, the solar chariot is depicted as Sol; in Vedic (and subsequently Hindu) cultures as Surya; and in Norse mythology as Solvognen. In Mesapotamia, Utu was the deity of the Sun – the god of justice and the descendent of Nannar (god of the Moon). To the Babylonians and Assyrians, Shamas (or Samas) was the equivalent, and similar gods were worshiped in the Akkadian and Hebrew pantheons – and well as throughout the Arabian peninsula – under different names. To the ancient Egyptians, the sun was associated with Ra, the god who ruled the sky, the Earth and the underworld. The Sun itself was named Aten, which was either the body or the eye of Ra. From the 25th century BCE onward, worship of Ra became widespread across Egypt, with many depictions of him being carried across the sky in a solar vessel accompanied by the lesser gods. In the case of New World civilizations, the Incas, Mayans and Aztecs all believed that human sacrifices were necessary to appease the Sun god and maintain the cycle of life. To the Aztecs, Huitzilopochtli – the god of war, the sun, human sacrifice and the patron of Tenochtitlan – was responsible for all their victories and defeats in battle, and could only be appeased through the offering of blood. To the Greeks, the Sun god was known as Helios, the son of the Titan Hyperion and the Titaness Theia. Similar to the Egyptian’s representations of Ra, Helios was commonly depicted as being carried by a chariot drawn by fiery horses. However, unlike their ancient forebears, the Greeks viewed the Sun as one of the seven planets, since it revolved once a year along the ecliptic through the zodiac. The Roman Empire adopted Helios into their own mythology as Sol. The title Sol Invictus (“the undefeated Sun”) was applied to several solar deities, and was depicted on several types of Roman coins during the 3rd and 4th centuries CE. The birth of “the undefeated Sun” was celebrated around this same time, on the 25th of December, soon after the winter solstice to mark the end of the days growing shorter. In Chinese mythology, the Deity of the Sun was known as Ri Gong Tai Yang Xing Jun (or Tai Yang Gong, “Grandfather Sun”) – aka. Star Lord of the Solar Palace, Lord of the Sun. Tai Yang Xing Jun is usually depicted with the Star Lord of the Lunar Palace and Lord of the Moon, Yue Gong Tai Yin Xing Jun (Tai Yin Niang Niang / Lady Tai Yin). Several famous temples and monuments were constructed in ancient times with worship of the Sun or solar phenomena in mind. For example, stone megaliths that marked the summer or winter solstice have been observed in Egypt, Malta, England (Stonehenge), Ireland, and at the ancient city of Chichen Itza in southern Mexico. Over time, ancient astronomers began to develop a scientific understanding of the Sun, based on ongoing observations of its movements. In the early 1st millennium BCE, Babylonian astronomers noted that the Sun’s motion along the ecliptic was not uniform. This would later be learned to be the result of the Earth’s elliptical orbit around the Sun. In the fifth century BCE, Greek philosopher Anaxagoras reasoned that the Sun was not the “chariot of Helios”, but a flaming ball whose light was reflected by the Moon. By the 3rd century BCE, Eratosthenes estimated the distance between the Earth and the Sun at either 4,080,000 stadia (755,000 km) or 804,000,000 stadia (148 – 153 million km, or 0.99 – 1.02 AU), the latter of which is correct to within a few percent. It was also during the 3rd century BCE that Greek astronomer Aristarchus of Samos would propose the idea that the Sun was at the center of the universe and the planets revolved it. This view would be adopted later by Seleucus of Seleucia (ca. 190 BC – ca. 150 BC), and would go on to be articulated by Islamic and Indian astronomers during the Middle Ages, particularly through the Samarkand Observatory. The contribution of Arab and Islamic scholars include Al-Battani (858 – 929 CE), who discovered that the direction of the Sun’s apogee (the point when the Sun appears to be moving slowest against the fixed stars) is subject to change. Egyptian astronomer Ibn Yunus (950 – 1009) observed more than 10,000 entries for the Sun’s position for many years using a large astrolabe. From an observation of a transit of Venus in 1032 CE, the Persian astronomer and polymath Ibn Sina (aka. Avicenna, ca. 980 – 1037) concluded that Venus is closer to Earth than the Sun. Ibn Rushd, the 12th century Andalusian astronomer, also provided a description of sunspots in the 12th century. Observations of sunspots were recorded earlier during the Han Dynasty (206 BCE – 220 CE) by Chinese astronomers, who maintained records of these observations for centuries. Nicolaus Copernicus‘ mathematical model of a heliocentric system revolutionized astronomy, and helped to usher in our modern understanding of the Sun’s importance in our universe. In addition to explaining observational discrepancies in the motion’s of the planets, the heliocentric model effectively placed the Sun at the center of the known universe. The development of the telescope in the early 17th century also allowed for detailed observations of the Sun and planets. Thomas Harriot, Galileo Galilei, Christoph Scheiner, and other astronomers were able to make accurate illustrations of the positions of sunspots on the Sun’s surface. In 1672, Giovanni Cassini and Jean Richer were able to determine the distance to Mars, and were thereby able to calculate the distance to the Sun. In 1666, Isaac Newton became the first scientist to observe the Sun’s light using a prism, and showed that it is made up of light of many colors. In 1800, William Herschel built on this by discovering infrared radiation using a series of thermometers and a prism. By noting temperature changes beyond the red part of the solar spectrum, he helped usher in the study of electromagnetism by determining that certain forms energy are invisible. Studies of the Sun’s light spectrum also led to advancements of spectroscopic studies in the 19th century. This culminated with Joseph von Fraunhofer’s discovery and recording of over 600 absorption lines in the spectrum, the strongest of which were grouped together and named “Fraunhofer lines”, after their founder. Another major area of study during the 19th century that would have an impact on our understanding of the Sun was the development of thermodynamics. A major contributor to this field was William Thomson (aka. Lord Kelvin, 1824 – 1907) who suggested that the Sun is a gradually cooling liquid body that is radiating an internal store of heat. Kelvin and Hermann von Helmholtz also proposed that a gravitational contraction mechanism was responsible for the Sun’s energy output. They also estimated the Sun’s age at 20 million years – which was in stark contrast to geological estimates that that placed the Earth’s age at at least 300 million years. By the 20th century, a documented solution for the Sun’s energy output was finally offered. The first came from Ernest Rutherford (1871 – 1937), who suggested the Sun’s output was maintained by an internal source of heat, and suggested radioactive decay as a possibility. But it would be Albert Einstein who would provide the essential clue to the Sun’s energy output with his mass-energy equivalence (E = mc²). In 1920, British astronomer and physicist Sir Arthur Eddington proposed that the pressures and temperatures at the core of the Sun could produce nuclear fusion whereby hydrogen atoms merge into helium nuclei, resulting in the production of energy from the net change in mass. This would later be confirmed by numerous studies conducted by physicists, which would also lead to the conclusion that the fusion of hydrogen is responsible for the formation of all known elements in the universe. With the beginning of the space age in the mid-20th century, the opportunity to observe the Sun with robotic space probes became possible for the first time. The first missions to the Sun were NASA’s Pioneer 5, 6, 7, 8 and 9 satellites, which were launched between 1959 and 1968. These probes orbited the Sun at a distance similar to that of Earth, and made the first detailed measurements of the solar wind and the solar magnetic field. In the 1970s, the Helios 1 and 2 probes – a U.S.-West-German collaboration that studied solar winds from inside Mercury’s orbit at perihelion – provided scientists with significant new data on solar wind and the solar corona. The Skylab Space Station, which was launched by NASA in 1973, also made numerous discoveries using its solar observatory – known as the Apollo Telescope Mount. These included the first observations of coronal mass ejections and of coronal holes, now known to be intimately associated with solar wind. In 1980, NASA launched the Solar Maximum Mission, a spacecraft designed to observe gamma rays, x-rays and UV radiation released by solar flares. Unfortunately, an electrical failure caused the probe to go into standby until it could be retrieved and repaired by the Space Shuttle Challenger in 1984. The mission subsequently acquired thousands of images of the solar corona before re-entering Earth’s atmosphere in June 1989. In 1991, the Japan Aerospace and Exploration Agency (JAXA) deployed the Yohkoh (Sunbeam) satellite, which observed solar flares at X-ray wavelengths. Until 2001, when an annular eclipse caused it to lose its lock on the Sun, it observed an entire solar cycle and determined that the corona was much more active in regions away from peak activity than previously thought. Launched in 1995, the joint ESA-NASA Solar and Heliospheric Observatory (SOHO) has gone on to become one of the most important solar missions in history. Situated at the Lagrangian point between Earth and the Sun, SOHO has provided a constant view of the Sun at many wavelengths since its launch. Originally intended to serve a two-year mission, a mission extension through 2012 was approved in 2009, and a follow-on mission was launched in 2010 – the Solar Dynamics Observatory (SDO). All these satellites observed the Sun from the plane of the ecliptic, and so have only observed its equatorial regions in detail. The first attempt to study the Sun from the polar regions was the Ulysses probe, a joint ESA-NASA mission which was launched in 1990. Once it assumed its scheduled orbit, the probe began observing the solar wind and magnetic field strength at high solar latitudes, finding that high-latitude solar wind moved slower than expected (750 km/s), and that there were large magnetic waves emerging from high latitudes that scattered galactic cosmic rays. In 2006, the Solar Terrestrial Relations Observatory (STEREO) mission was launched, which consisted of two identical spacecraft being launched into orbits that caused them to alternately pull further ahead of and fall gradually behind Earth. This enables stereoscopic imaging of the Sun and solar phenomena, such as coronal mass ejections. Many more solar missions are planned for the coming years and decades. These include the Indian Space Research Organisation’s (ISRO) scheduled mission of Aditya – a 100 kg satellite that is slated for launch in 2017–18. Its main instrument will be a coronagraph for studying the dynamics of the Solar corona. In 2017, the ESA plans to launch the Solar Orbiter, which will study how the Sun creates and controls its heliosphere. The mission will fly as close as 0.28 AU to capture its measurements. In 2018, NASA plans to launch its Solar Probe Plus, which will approach the Sun from a distance of 8.5 solar radii to take direct measurements of the particles and energy emanating from the Sun’s corona. Lastly, there is NASA’s Solar Sentinels mission, an as-of-yet unscheduled mission that will involve a group of six spacecraft – four stationed inside the orbits of Venus and Mercury, one behind the Sun and one orbiting Earth. Together, they will study the sun during solar maximum, research energetic particles, coronal mass ejections and interplanetary shocks in the inner heliosphere. This data will be used to forecast space weather for future human spaceflight missions. The Sun does much more for us than just provide light and heat. It also provides all the energy that allows for chemical reactions and metabolic reactions, which is what began the life cycle here on Earth in the first place. The continuous energy that it gives us, combined with our atmosphere’s protective presence, ensures that this life cycle keeps going. The Sun also lets off potentially harmful rays, solar winds and material that would kill us if it were not for the Earth’s magnetic field. However, the solar winds carry this charged material out to the edge of the Solar System where it forms a magnetic field that in turn prevents other interplanetary material from getting in. 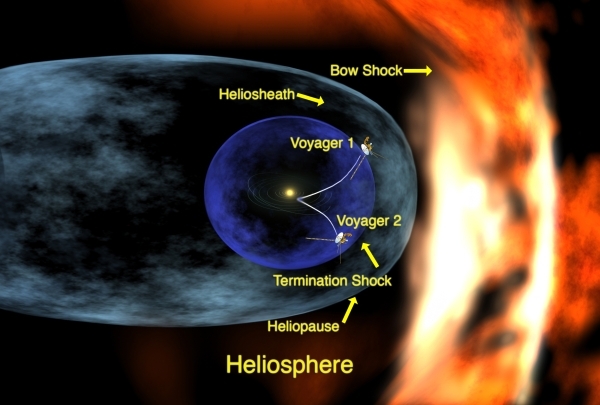 Without this barrier (the heliopause), the Solar System would be battered by cosmic rays. In this respect, the Sun is a great provider, and the Earth is ideally situated to benefit from its presence. We are not too close, nor too far so as to be too hot (like Venus) or too cold (like Mars). We are also secure in the knowledge that by the time the Sun expands to the point where life can no longer exist on Earth, we will either be long gone, or have evolved beyond the point where we live on only one planet.